The last stop of our Black Friday evening outing was the Denver West Barnes & Noble. Laurel spent most of the visit happily looking at books in the kids' section, but when we tried to get her to look at the bargain children's book selection she bolted past it into parts unknown as I tried to keep up. 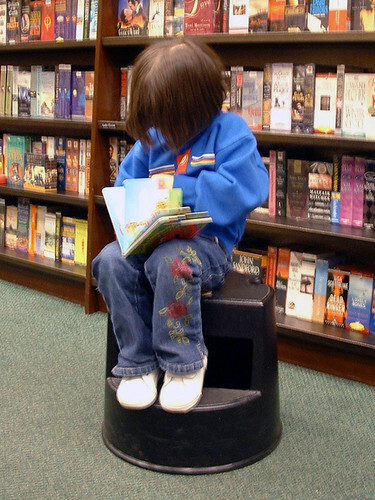 It turned out she was just looking for a different place to sit down and read. There are wee little benches in the children's area at the store; I couldn't sit on them comfortably, but they were just the right size for Laurel. I took the photo of her sitting in front of the audiobooks after she bolted by the children's bargain rack (in with the other bargain books).